Rapid urban expansion and associated construction activities are a significant source of stress to the natural environment. Construction activities accelerate natural processes of erosion and sedimentation as vegetation is stripped away and soils are left exposed. As a result, stormwater runoff from these sites contains high levels of sediment and associated contaminants. Implementation of adequate water quality controls at construction sites is crucial to ensuring downstream receiving waters and aquatic habitats are adequately protected. The Erosion and Sediment Control Guideline for Urban Construction (December 2006), produced by the Greater Golden Horseshoe Area Conservation Authorities, provides guidance on the measures recommended on construction sites for erosion and sediment control. 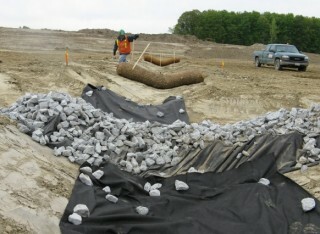 The practices are classified as erosion prevention, sediment controls and in-stream controls. Examples of each are provided in the table below. Erosion Prevention Practices: These source control measures are intended to provide stabilization of exposed soils in order to prevent erosion, and thereby decrease the amount of sediment suspended in stormwater runoff from the site. Sediment Control Practices: The majority of these practices are non-vegetative physical measures used to mitigate against erosion and prevent sediment-laden storm runoff from being conveyed off-site and into nearby lakes and streams. In-Stream Control Practices: These practices are used during in-stream construction projects such as culverts or bridge crossings. They are intended to ensure that habitat disturbance is kept to a minimum and that work activities are isolated from the rest of the stream. In addition to these practices, proper planning, scheduling and maintenance are also key factors in ensuring the effective control of erosion and sediment from a construction site. This includes measures such as the phasing of construction activities to ensure that land is left exposed for the minimum amount of time necessary.